American Pen Company sought advice from around the globe before engineering and designing these world-class writing instruments. Then they set about manufacturing these fountain pens, rollerballs, inkballs and ballpoints in the great old U.S.A. only after reestablishing entirely new network of craftsmen. 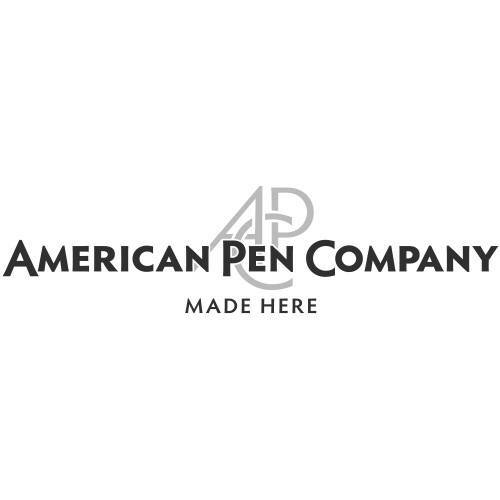 We think you will be impressed with not only the quality, but the performance and ultimate value of each Made-in-the-U.S.A. offering from the American Pen Company. What makes for a ‘fine writing’ ballpoint pen? These fountain pens feature a German made Schmidt steel nib commonly found on $250 - $450 pens. American Pen Company wanted to bring this nib to the market in a pen at a dramatically lower price. The Minimalist is an indestructible capped fountain pen that can reside safely in pocket or purse. The body is machined from a solid rod of Stainless Steel. It can take any amount of abuse and still be a high-performance writer. Simply insert a standard international cartridge and you’re set to go. Even better, choose any ink in your stock and fill with a converter. Those simple two ball bearings prevent the Minimalist from rolling away. The APC Independence is more suited to the executive suite. Crafted from a solid bar of resin and then covered in a proprietary coating it’s guaranteed to be the highlight of every meeting. Handcrafted in America, it can be compared to others at twice the price. An ingenious magnetic capping system eliminates a weak point of many pens; the threads. The clip is made from a solid bar of steel to ensure it never breaks. Independence ships with a custom-made Colorado Beetle Kill Pine Pen Rest. Crafted from recycled wood, by hand, right here in Colorado. American Pen Company has had many requests for a pen which would utilize a refill capable of laying down a lot of ink. This requires a fiber tip of some size. Introducing the APC Independence Signature Tip. This German made refill allows for fast, precise and creative signatures without bleed-through. Available in black or blue. With a light touch, Signature Tip produces a nice clean line. A heavier hand can produce fast, large letters.